The cable, purported to be for a 4.7-inch "iPhone 7," was posted to Chinese microblogging site Weibo, and spotlighted by Nowhereelse.fr. It shows a layout largely similar to the cable for Apple's iPhone 6s, and includes space for both the Lightning port and a headphone jack. Thus far, virtually all "iPhone 7" leaks have suggested Apple will move away from the headphone jack. Instead, Apple is rumored to ship a pair of Lightning-connected EarPods with its next iPhone, and to push accessory makers to offer their own Lightning headphones. Apple is also rumored to be working on a pair of Bluetooth EarPods that would recharge through the iPhone's Lightning port and be sold separately. 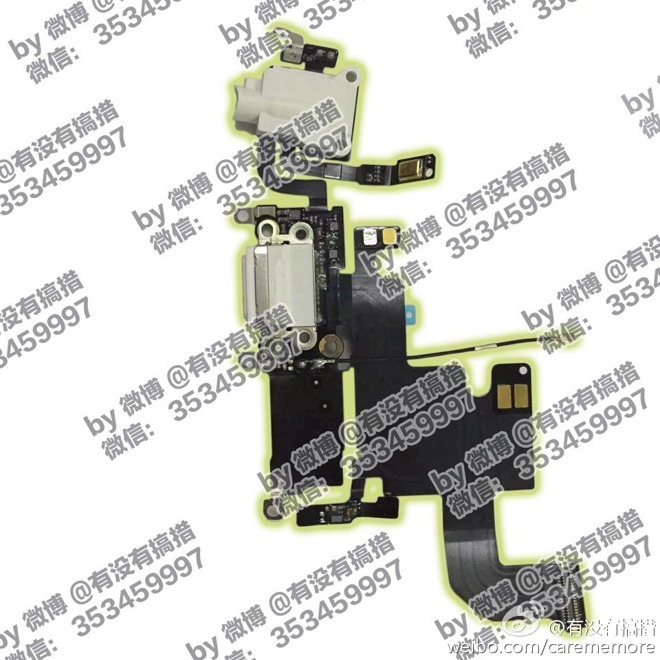 And alleged "iPhone 7" case leaks have suggested the back of the device could feature a Smart Connector, which would allow for the device to be recharged, much like an iPad Pro, while using headphones through the Lightning port. Apple is expected to launch its next-generation iPhone in September, its usual annual timeframe. It's likely to start at the same $649 starting price as Apple's current flagship handset, the iPhone 6s.